I’m putting together a handout for my digital storytelling program which includes booklists for parents. I’m including apps and iBooks based on books that the library owns, and eBooks that are available through the library’s website. 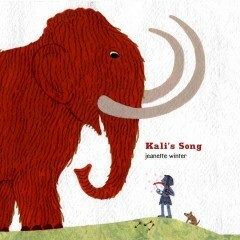 As I was hunting through Blio I saw that Kali’s Song was available as an eBook. After I did a little happy dance about the fact that the file was actually available for me to check out, I downloaded the Blio app onto my Nexus S and signed into my account. I really, really want to like Blio; to be impressed by how much better it is than OverDrive for children’s books. Today I just did not have that experience. It takes a very long time for the book to load at all, and the text and illustrations are formatted to be held portrait style. If you hold your device landscape it takes forever to load again, and the text gets mangled and separated from the illustrations. I will try on the iPad as well, but I suspect it is a function of Blio, not the device. This book itself is just lovely; I read it first as a tree book. It’s about a caveboy whose parents are teaching him how to hunt mammoths with a bow and arrow. Kali uses the bow to make beautiful music instead. Posted on September 7, 2012, in eBook, Review and tagged Axis 360, Blio. Bookmark the permalink. Leave a comment.